To learn more about the ins-and-outs of how to plan an event, visit our Skills and Resources Toolbox. 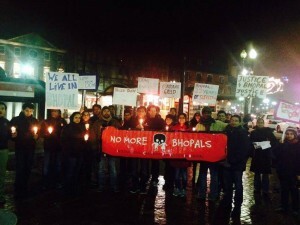 Are you ready to take action for Bhopal? Here are some ideas that should help get you started. These ideas are infinitely variable, and you’re limited only by your own creativity. During actions, don’t forget to let attendees know how they can get involved. Include sign-up sheets, fact sheets and other campaign resources. Garnering media attention is very important. Think about how you can make your event stand out. Have a great idea not listed here? Let us know! No matter what you do, make sure you take photos and keep us updated! 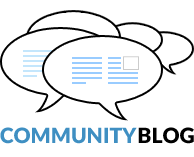 If you are planning a larger campaign to pass a resolution against Dow or to kick Dow funding out of your community, these are great actions to show your community what Dow is about. Concoct a nasty brew of foul-tasting ingredients and hand it out on a silver platter. Dress up as a waiter and approach people. Invite them to try the Bhopal water. 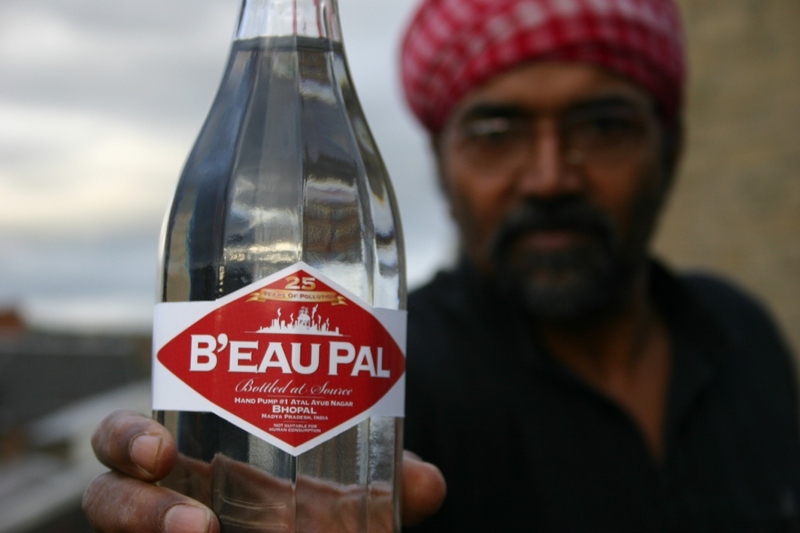 Educate yourself beforehand about the toxins found in actual Bhopal water. Take it to the next level by dressing up as Dow executives and angrily assert that the water is clean and fine for drinking. Refuse to drink the water yourselves but insist that others do so. Real Bhopal water has a strong chemical odor, contains heavy metals and toxic chemicals, and is unfit for drinking – yet it is consumed by an estimated 20,000 people in Bhopal on a daily basis because they have no other options. 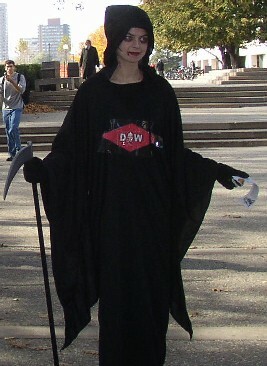 Dress up as the “Dow Grim Reaper” by painting or taping Dow’s symbol on the front of a Grim Reaper costume. Hand out “death slips” that explain how and why your victims have died. 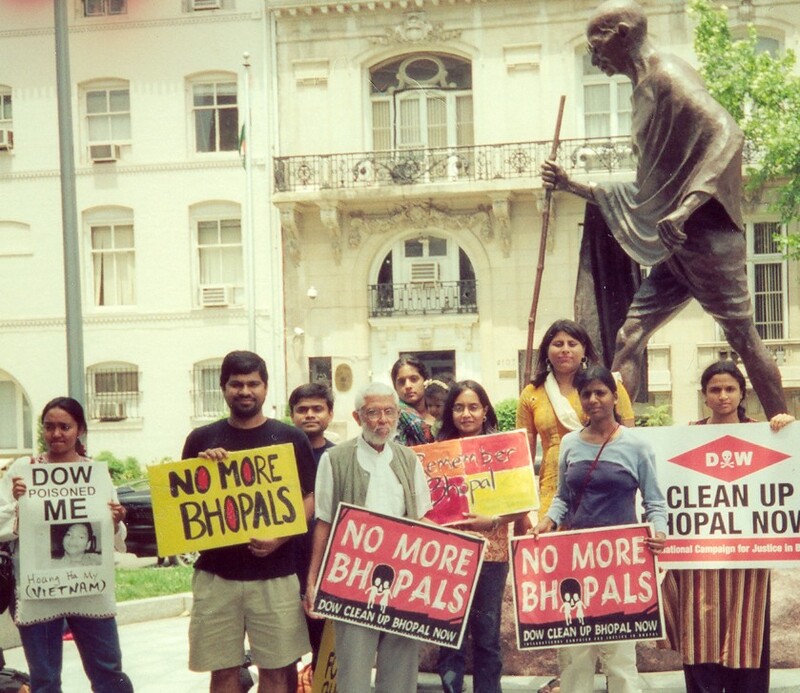 It’s a unique way to spread the word about the Bhopal gas disaster –and let everyone know who’s responsible! Organize a short race to dramatize and re-create the disaster. 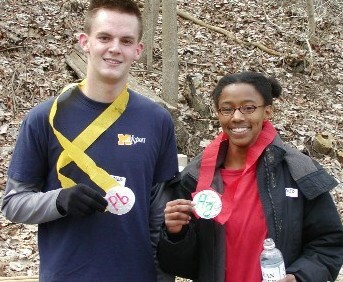 Begin with a (dry ice) gas “leak” outside a Dow building if you have one on campus or at a nearby Dow facility, and urge the runners to dash for safety. Award the winners with “metals” symbolizing the continuing chemical and heavy metal contamination that burdens the communities of Bhopal. Check out this “Run for Your Life” ad that appeared in the Ann Arbor News. This is a creative and engaging way of educating your community on the Bhopal gas disaster. It is a particularly useful mock trial for law students. It involves a presentation of evidence, prosecution, defense, and an impartial jury which can convict Dow on the basis of the evidence presented. The whole process is interactive theater from start to finish, which lends itself to media coverage: “University Students Prosecute $40 Billion Company for Corporate Manslaughter”. You can even give interviews “in character” as the prosecutor or as a juror. 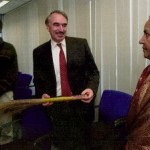 Give Dow an “award” or jhadoo (see below) for its infamous legacy in Bhopal. The award can be as fancy as a plaque or as easy as a certificate made from construction paper. You can also present a Pinocchio nose to congratulate Dow on their lie-ability. Give the award to a Dow representative in your community or at your school, a recipient of Dow funding. You can also have someone dress up as the “Dow Grim Reaper” and present the award to this person. You can then send on the actual award and photographs of the ceremony to Dow headquarters in Midland. 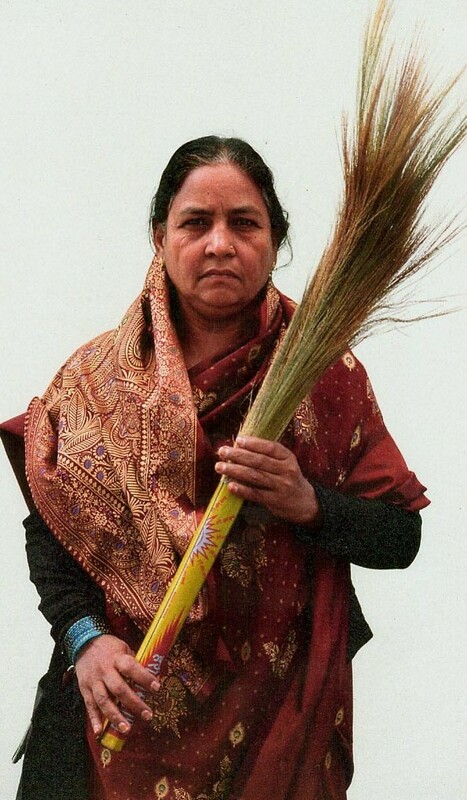 Jhadoo, n. 1. 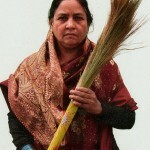 A traditional Indian broom used often in household chores. 2. A potent symbol of women’s power, used often as a weapon in domestic disputes. 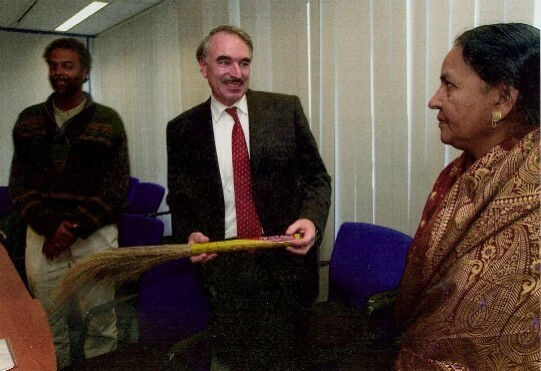 Jhadoo, v. To shame a prominent official responsible for creating or perpetuating the suffering of the Bhopali people, most often executives or officials of the Dow Chemical Company, with the delivery of a jhadoo. Jhadoos have been delivered to Dow executives and officials all over the world, and have become a symbol of the survivors’ demand for justice. Deliver one to a Dow official near you. Reminder: ICJB does not condone violence or threats. We would never ask nor want anyone to do actions for Bhopal that are violent in nature. A. Know Thy Neighbor: Organize a group of supporters to canvass the Board member’s neighborhood. Talk with residents about Bhopal, and answer their questions about Dow’s responsibility for ongoing chemical terror. Ask them to sign a postcard to their neighbor regarding the problem (print out postcards or ask us to mail you some). B. Make a Delivery: Present Board members with signed postcards, a “sample” of Bhopal water or the photo of a Bhopal victim. Hold a candlelight vigil or a protest outside their house if they refuse to meet with you and invite the media. C. Present Them with an “Award”: Give Dow Board members an “award” or jhadoo (see above) for their infamous legacy in Bhopal. The award can be as fancy as a plaque or as easy as a certificate made from construction paper. If you live near Washington DC, New York City, Chicago, Houston, or San Francisco, then you live near an Indian government embassy or consulate location! If you would like to lead a peaceful event outside one of these locations, please let us know. Petitions are the time-honored way of demonstrating public support for your campaign and can also be a useful tool for introducing people to an issue. Depending on the content, petitions can put pressure on targets, raise awareness, or both. 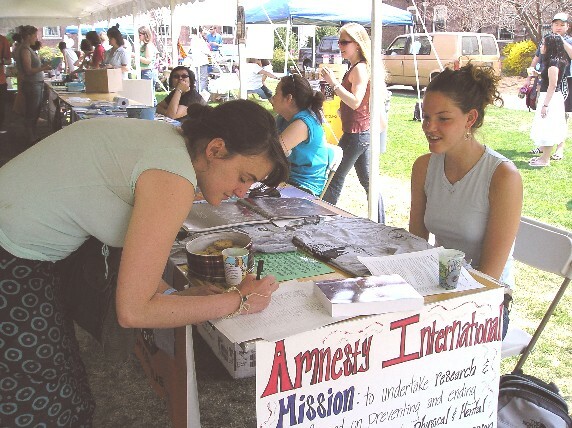 Rather than assigning a few people to sit at a table and collect signatures, it’s more efficient for everyone in the group to get in on the act and collect 20 or so signatures per week (or more if you can) from friends, family, etc. As with other kinds of sign-up sheets, it’s good to put yourself and a few friends at the top of the sheet so nobody has to be the first. Keep the original petition and send copies of it to your target(s). Add everyone who signs your petition to a low-traffic “action alert” email list, so that they’ll know about other opportunities to support your efforts. 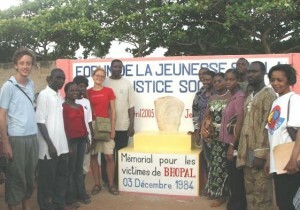 Contact us to find out if there is a current ICJB petition that we need signatures for. Invite a speaker to come and discuss the disaster, its aftermath and the ongoing struggle for justice. If you are a student, you can coordinate this with one of your professors or your department. Invite your friends, family, classmates, professors and members of the University administration to attend or participate. There are a variety of speakers, from legal experts to activists. Contact us to find out if there are speakers available near you. If you’re a high school or college student, ask your teachers if they would be willing to discuss Bhopal in your class or allow you to do a short presentation to your fellow classmates. This is especially appropriate for classes such as Social Studies, History, Chemistry, Business Management, Political Science, and Environmental Studies. There are also many scholarly articles and books which your teacher could assign your class. There are several documentaries on the Bhopal gas disaster. 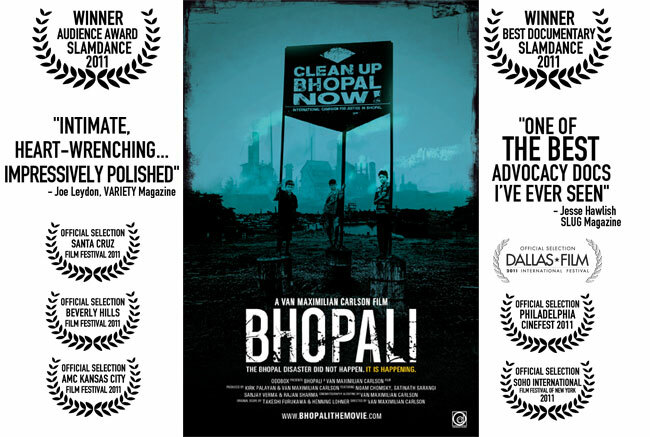 A great recent documentary is Van Maximilian Carlson’s Bhopali, which is a feature-length documentary on the ongoing impact of the Bhopal gas disaster. If you need a copy of a specific film, let us know. Bhopal “tells the story of how complex forces struggled to bury the truth, expose it, or shape it to the needs of self-interest, and how an unspeakable disaster ended all speculation. Ultimately, though, it is about – and for – those without means or influence, whose voices are seldom heard and yet who are made to pay the cost.” In January 2014, it was performed at the Teesri Duniya Theatre in Montreal, Canada and received excellent reviews! “We are not Flowers, We are Flames!”, a powerful exhibition of photographs by Raghu Rai and Maude Dorr, is available for exhibition. This exhibit documents the horror of the disaster and the perseverance and determination of those who survived to demand justice, accountability, and their basic human right to an environment free of toxins. Shipping costs are estimated between $90.00 and $120.00. Contact us to request the exhibit. Invite the students to participate in a poetry or artistic competition with a Bhopal gas disaster-related theme. Organize an exhibition/recitation that is open to the public. Consider sending the winning entries to Dow. Some poetry on Bhopal is available in our resources section. Write an article about the Bhopal gas disaster for your local/campus newspaper. Ask the paper to do a story on your group’s activities or submit an op-ed column with a local angle. You can also set up an interview for yourself or a member of the campaign on your local radio station. 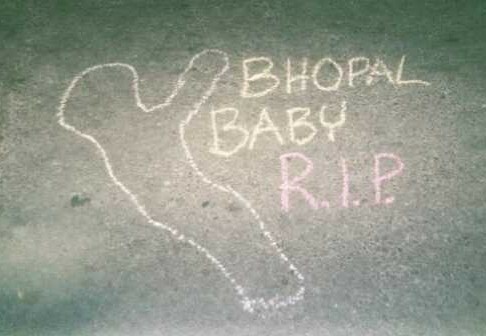 Among all those who died in Bhopal it’s easy to lose track of the individuals that Dow-Carbide killed. Reminding everyone that 25,000 deaths is more than just a number can be a powerful event. Organize a public reading of the names of some of those who gave their lives. You can also do so visually, by chalking a list of names. You could also construct gravestones or human-size silhouette cut-outs in black and print the name and story of a Bhopali victim killed by Dow-Carbide. The only memorial ever built in Bhopal was designed by a descendant of the Holocaust. Inscribed on its sides are the words “No Hiroshima, No Bhopal – We Want to Live.” Design your own Bhopal memorial in your community. You might want to include a list of names or it may be more symbolic (e.g. a funeral procession). 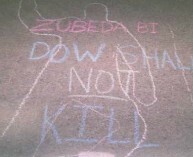 Chalking is cheap, fun, creative and effective. Possibilities include: sketching body outlines, writing the names of Bhopal gas disaster victims inside, or writing Bhopal-related slogans. Hang a large banner with a compelling message from a high spot. This is a great photo-op.